Who knew drywall could be fun? If you’d told me that you just saw a really cool business-to-business print ad for a performance drywall product line I would have thrown you in the river with your own baby and the bathwater. When CertainTeed asked us to produce a trade print campaign for their suite of gypsum (drywall, to the rest of us) products we decided that if we were going to do it, we were going to make it as cool as possible. So we were thrilled when this work appeared in issue 1/2018 of Lürzer’s Archive. Below is my partner’s description of the project because she’s a much better writer than I am. "Everyday, walls are under attack from forces like bumps and dents, loud noises and even formaldehyde in the air. Luckily, walls built with the right drywall materials, like those from CertainTeed, can fend off whatever life throws at them. 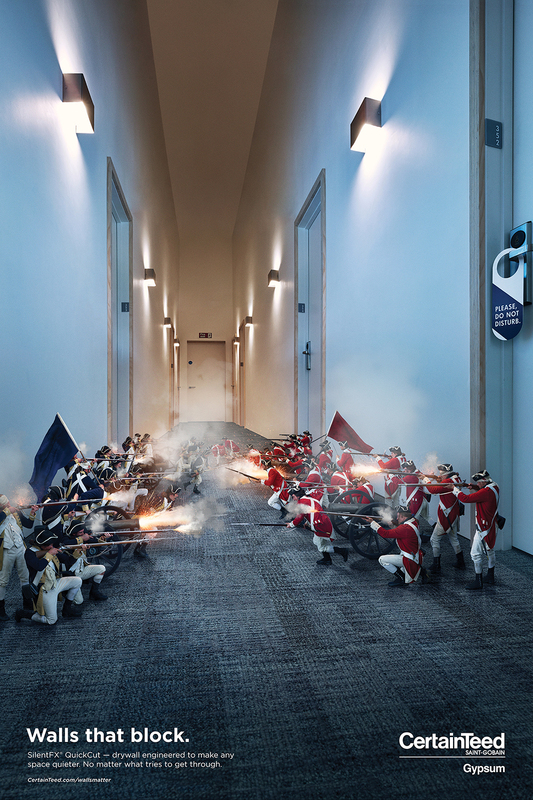 To illustrate the tiny battles that are being waged daily against walls, we worked with a talented Photographer and CGI team to create a series of ads that show walls constructed with CertainTeed drywall products fending off everyday nuisances in a dramatic, visually striking way."